Denver Nuggets guard Jamal Murray (27) drives past Orlando Magic forward Aaron Gordon (00) during the second half at Amway Center. (Photo: Reinhold Matay-USA TODAY Sports). Denver kept its road swing rolling with another win on Wednesday night. 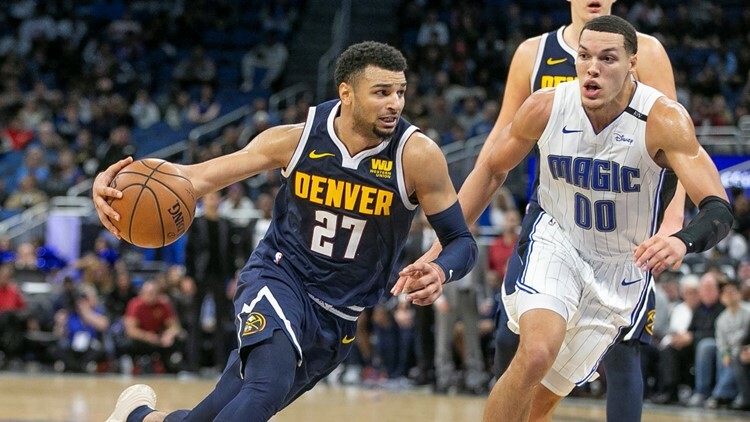 Jamal Murray scored 31 points and the Denver Nuggets shut down the Orlando Magic in overtime for their seventh straight victory, 124-118 on Wednesday night. Evan Fournier led Orlando with 26 points before fouling out in overtime. Nikola Vucevic added 24 points and 15 rebounds.Orlando made 20 of 43 3-pointers during regulation against the NBA's best 3-point defense, but the Magic made only one of nine shots in overtime and missed all six of their 3-pointers. Mo Bamba's 3-pointer put the Magic ahead 41-39 midway through the second quarter, and Evan Fournier made four of Orlando's eight threes in the third quarter to help the Magic push the lead to as many as six points. Magic: A day after holding the Heat to just five free throws in a game at Miami, the Magic shot no free throws until Jonathan Isaac made two at 9:13 of the fourth quarter. ... Ross had 17 points, his average over the last seven games.